If there's one thing that's true about the Bacon & Lox Society, it's that we enthusiastically believe we're all at our best when we're learning something new. We're not just about celebrating, but about celebrating creatively! We love giving our guests a combination group activity and ice-breaker at our Chinese-Ish New Year festivities. 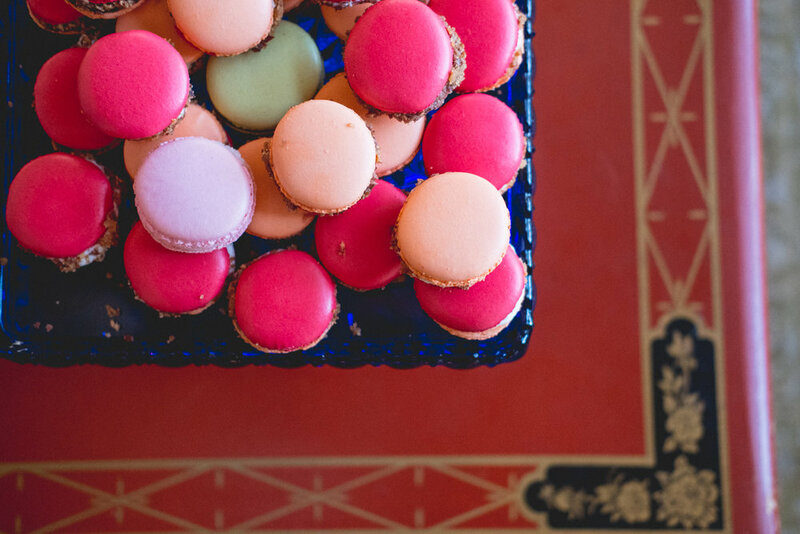 One year, this took the form of a macaron painting workshop led by Collective member Laruen Nisenson of Sugar & Script. Predictably, the results were delicious! The process actually started a few days before the party, when I commissioned custom Bacon & Lox Chinese New Year-inspired macarons from the wonderful Kitchen Chemistry in Stroudburg, PA. I worked directly with the owner Lisa to create custom flavors that I thought would make for a fun combination. I chose Sriracha not just because red is the Chinese color of prosperity, but because a dash of "rooster sauce" was perfect for the upcoming Chinese Year of the Rooster. Orange was added because it represents fortune and good health, and of course we rolled them all in candied bacon to make sure we involved our namesake! After a good two or three days of curing (they're more airy and delicious that way), they were perfect and ready for decoration! 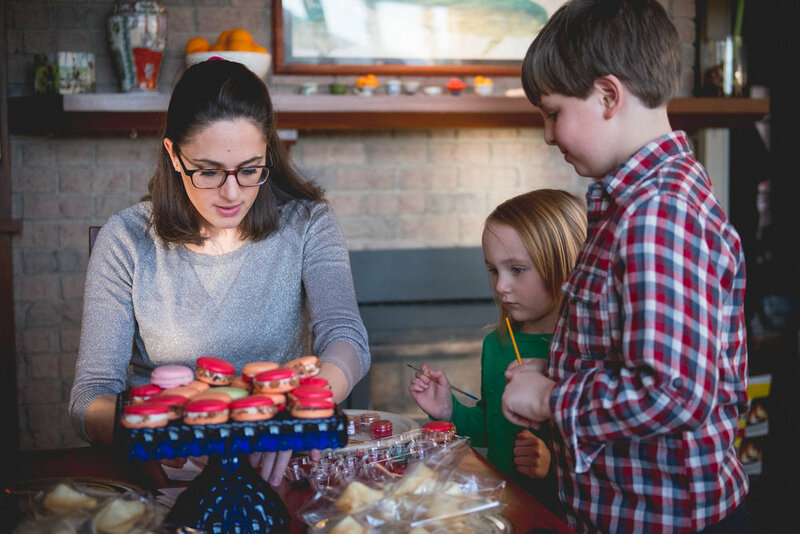 In terms of party planning, our macaron painting demonstration and mini-workshop is great to have toward the beginning of the festivities. Doing it first gave people an easy way to break the ice and introduce each other as they worked together. Lauren showed us the finer points of pastry-decoration, and it was genuinely exciting to learn so many new things! One big take-away was that she uses vodka (not water) to dissolve the edible pigments, to keep the cookies from getting soggy. Everybody worked on their own designs and colors, each of us expressing ourselves creatively and then enjoying the delicious results! 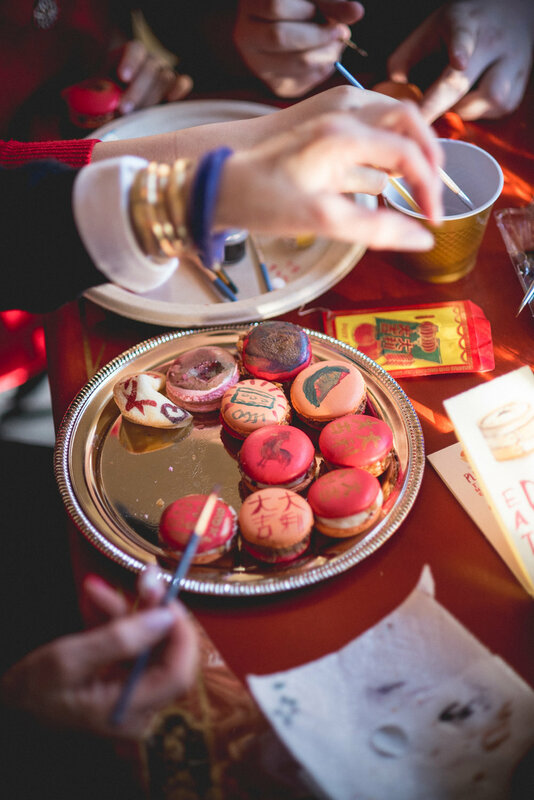 There were roosters, all sorts of Chinese calligraphy, and more designs adorning all the tasty macarons. With everybody participating (this is a really fun way for partygoers of all ages to spend time together) we all got to bond, get a little creative, and learn something new at the same time.